This is an alpine adventure that takes you through the beautiful backcountry of Ashley National Forest. An abundance of trees, trout streams, and fresh, cool mountain air makes this an excellent retreat from the hot summer temperatures of Flaming Gorge's desert regions. The route offers outstanding views of the Uinta Mountains and Flaming Gorge and passes by the Ute Mountain Fire Lookout Tower. From Vernal, head north on US 191/UT44. At the junction for the Flaming Gorge Dam, continue on UT 44 to the Deep Creek turnoff 9FS 539), located between mileposts 11 and 12. From Manila, FS 539 is 16 miles south on UT 44. The trailhead is located 2 miles down the Deep Creek Road at Elk Park. Pedal west down the Deep Creek Road, through the campground, and across Carter Creek. The trail here climbs for about 2.5 miles to the junction with FS 221, signed for Spirit Lake, Browne Lake, and Sheep Creek Lake. Follow this dirt double-track road for 1.5 miles to FS5. Turn left of this trail, climbing up to the lookout tower on Ute Mountain. 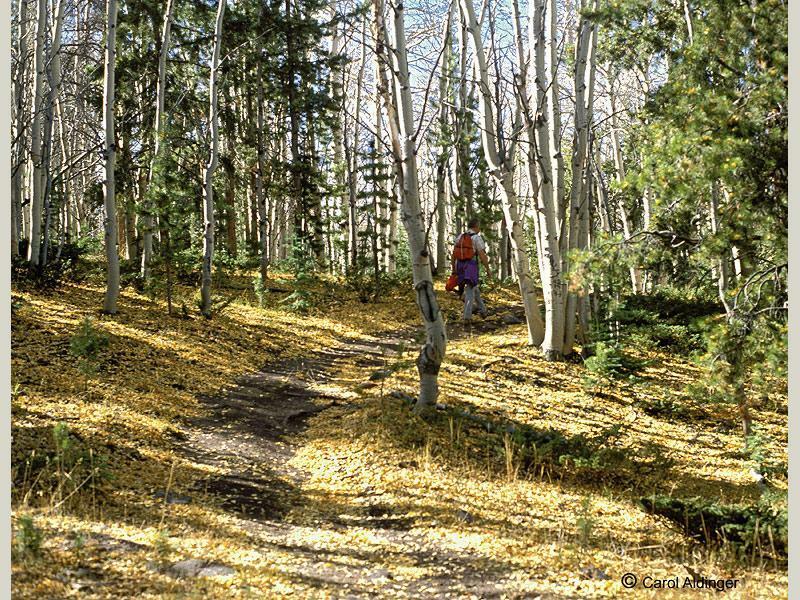 On the south side of the tower, ride down the single-track trail signed Ute Mountain Trail 005. Follow the trail through the meadow ahead to the fence line bordering Browne Lake. Follow the fence line briefly (50 yds.) then cross the meadow on the single track. The trail here is vague. Look for posts, tree blazes, and diamonds marking the route. The trail then parallels Carter Creek. 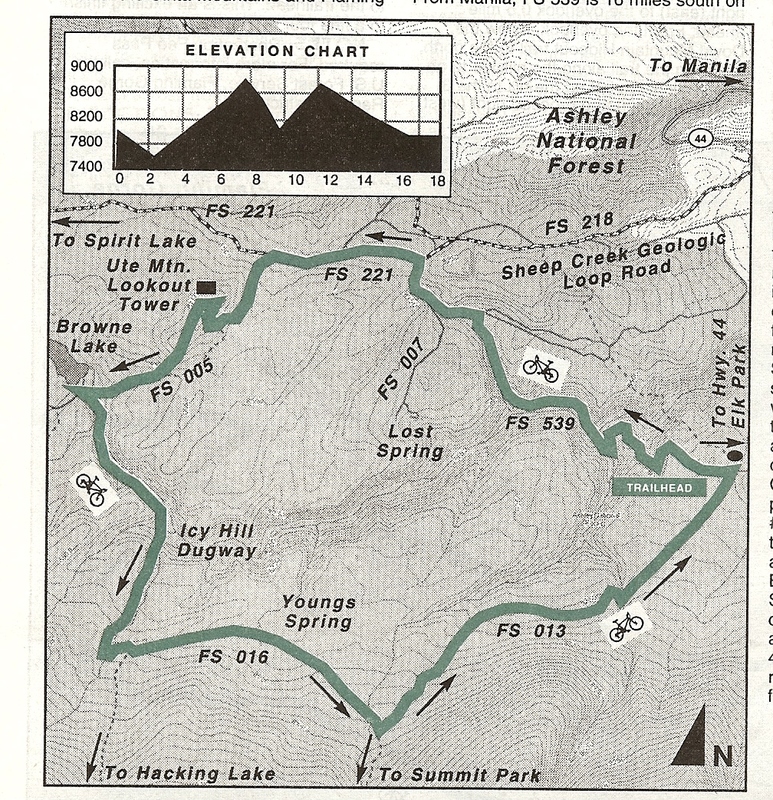 After about a mile, stay right at the junction for Lost Spring Trail (FS 007), and continue straight to Youngs Spring Park. Ahead you will probably need to carry your bike up the short, but steep, Icy Hill Dugway. Take an immediate left for Young Spring and climb the short hill to the junction for Old Carter Trail #016. Head east, following posts for FT 016. This trail intersects Trail #014, but stay on #016 on the ride side of the meadow. Continue on the rough trail to a faint junction signed for South Elk Park, Elk Park, Old Carter Trail, and Young Spring. Turn left on the single-track trail, cross the East Fork of Deep Creek ahead, and push your bike up the steep hill to the 4WD road. In the meadow ahead, take a right, then a left (carsonite post here) and follow the trail back to your vehicle. 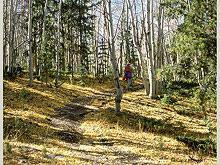 Thank you for visiting http://www.flaminggorgecountry.com/Elk-Park! Be sure and revisit flaminggorgecountry.com frequently for content updates and more.